SNAPPER ROCKS, Queensland/Australia (Saturday, 25 February, 2012) – The Quiksilver Pro Gold Coast presented by Land Rover kicked off the 2012 ASP World Championship Tour with some great performances in shifty three-to-four foot (2 meter) surf at Snapper Rocks today. The Top 34 surfers in the world went for broke in the opening non-elimination round, the winners advance directly into Round 3, while 2nd and 3rd are forced to battle it out in Round 2. Kelly Slater (USA), 40, reigning 11 x ASP World Champion and defending event winner, sent a clear message to his fellow competitors by posting a massive 18.80 (out of a possible 20) in the first 10 minutes of his opening heat of 2012. Slater was matched up against 2012 ASP rookie sensation Kolohe Andino (USA), 17, and event trials’ winner Garrett Parkes (AUS), 20. John John Florence (HAW), 19, fresh from his maiden Vans Triple Crown win, posted the highest heat total of the day, a near perfect 19.60 (out of a possible 20). 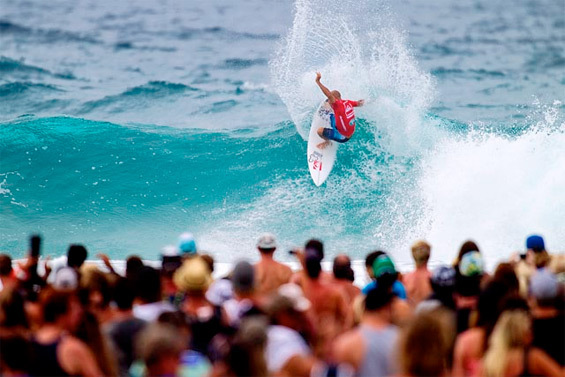 This is Florence’s first Quiksilver Pro Gold Coast and he was the only 2012 rookie to notch a Round 1 win today. Owen Wright (AUS), 22, scored an epic come-from-behind victory in an all-Australian heat against Bede Durbidge (AUS), 28, and Kai Otton (AUS), 32. Durbidge took control of the heat early, but failed to find a backup score after posting the highest wave score of the heat and was overtaken by Wright who managed to find two good scores. Adam Melling (AUS), 26, took out an action packed heat against Joel Parkinson (AUS), 30, and Dane Reynolds (USA), 26. All three surfers lit up the Snapper lineup with massive turns and deep tubes, but it was Melling who put his Lennox Head pointbreak experience to good use by catching the best waves. Raoni Monteiro (BRA), 29, was ecstatic after his heat win against ASP World Championship Tour rookies Gabriel Medina (BRA), 18, and Yadin Nicol (AUS), 26. Michel Bourez (PYF), 26, advanced directly into Round 3 after an incredible tube that netted him a 9.67 (out of a possible 10), the highest single wave score of the day. Mick Fanning (AUS), 30, two-times ASP World Champion and former event winner, was on point in his Round 1 heat at the Quiksilver Pro today. Fanning used his local knowledge to position himself in the best spot to capitalise on the available tube rides, finishing the waves off with his signature speed carves.